Tony Owen NDM along with UPA Planning have completed schematic designs for the new, under construction, Abu Dhabi Ladies Club. The 50,000 sq m facility is located on the waterfront in Abu Dhabi city. The project will contain cultural, recreational and education facilities for women in the UAE. The Club will include a conference hall and accommodation, multi-purpose auditorium, indoor and outdoor sports facilities, indoor and outdoor swimming pools and a spa facility, women’s health facilities, craft and education facilities and childrens’ creche and recreation areas. The design is derived from the folding of traditional Islamic fabrics and patterns. The complex consists of a series of wings arranged around a central covered festival space. 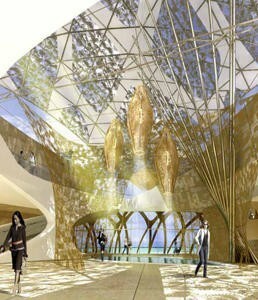 A feature of the design is a series of large fabric roof forms derived from the petals of a flower. These roofs are made from a unique pattern using 2 types of PVC fabric; a solid fabric and a translucent lace fabric. This design alows for areas of shade and areas of natural light. The facades of the curved walls contain a distinctive window patterning. This pattern is based on the braching pattern of foliage and is derived using computer generated ‘L-System’ modelling.